I never really went for sauerkraut. I love cabbage a dozen ways–steamed, or rolled around a filling and baked in a sauce, or blanketed with cheese, or shredded raw in a slaw or taco filling. But fermented?–No thanks. So I can add one more food product to my growing list of those that taste completely different when fresh or prepared authentically. Ever taste canned asparagus?–Don’t. 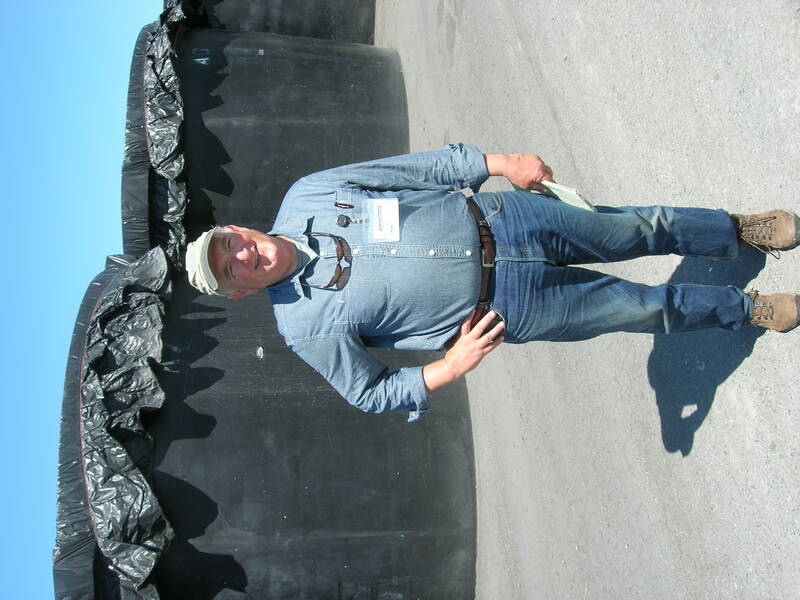 Still shaking Parmesan from the green can?–Stop; buy a block of the real stuff and grate it yourself. 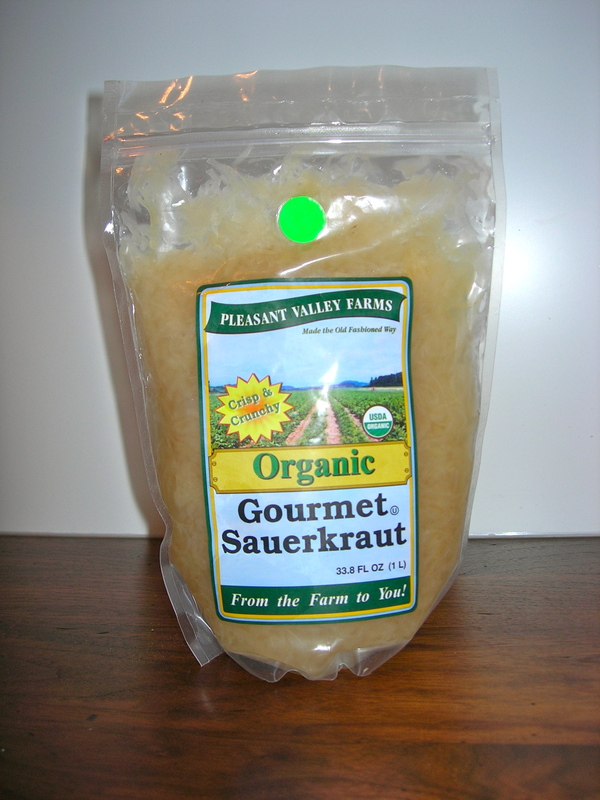 And go get some of this great kraut. You can get it at Whole Foods now; look for it in its plastic pouch in the refrigerated case (and store it in your fridge at home). After my Thanksgiving cook-a-thon (timelines! flowcharts! ), I got interested again in the problem of recipes for whole meals, not just single dishes. So here is one way to use this sauerkraut in a very nice dinner for a chilly autumn evening! Start about an hour and a half before you want to eat. After the beets are roasted (say after you’ve watched the news), put them on a plate to cool and start the bratwurst. Bring a pan of water to a simmer, add the brats, and let them simmer for about 20-25 minutes. (Don’t boil them!–The casing will split open). Turn them over every so often. After you’ve gotten the brats going, make a vinaigrette for the beets. Mince a clove of garlic, then add a half-teaspoon of kosher salt on top. Smear the garlic and salt around with the side of a knife-blade until you have a paste. Put it in a small bowl and mix it with a half-teaspoon of a nice coarse (country-style) dijon mustard and a tablespoon of good vinegar. (I used a nice sherry vinegar.) Then, whisking like crazy, add three tablespoons of a good olive oil. (I fill a tablespoon with oil, then rest that hand on the rim of the bowl and let the oil drizzle in as I whisk with the other hand. Then repeat twice.) Set the vinaigrette aside for now to let the flavors blend. Chop about a quarter-cup of walnuts; toast them if you want to in a dry skillet (but watch them like a hawk because they burn easily). Close to the end of the wurst’s simmer, heat up a skillet, turn the heat to medium-low, and add a little oil. When the sausage is done, transfer it to the skillet and turn it occasionally as it browns nicely. Everything ready? Make two beds on your plate, one of sauerkraut and one of beet greens. 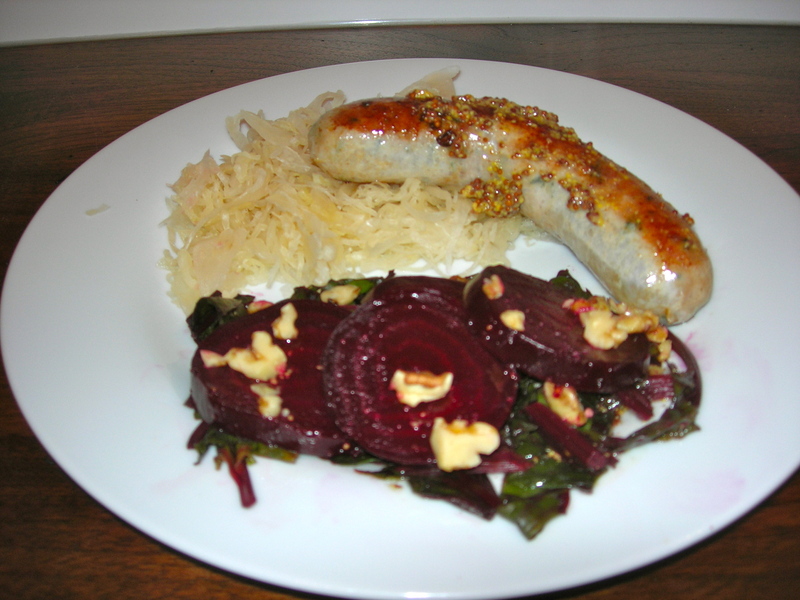 Put the bratwurst on the sauerkraut and the dressed beet slices on the greens. Add some of the dijon mustard to the brat if you like. Sprinkle the beets with the rest of the chopped walnuts. Pour yourself a German beer or a sturdy red wine and enjoy!